The EUnetHTA Companion Guide is EUnetHTA’s comprehensive repository that aims to provide ultimate support and guidance for the assessment teams. The tool comprises all components of the EUnetHTA Quality Management (QM) System, i.e. process flows, standard operating procedures (SOPs), templates, scientific guidance and tools, as well as QM-related training. The Companion Guide is created and managed by IQWiG (Germany) and the section related to Scientific Guidance & Tools is developed and maintained by KCE (Belgium). 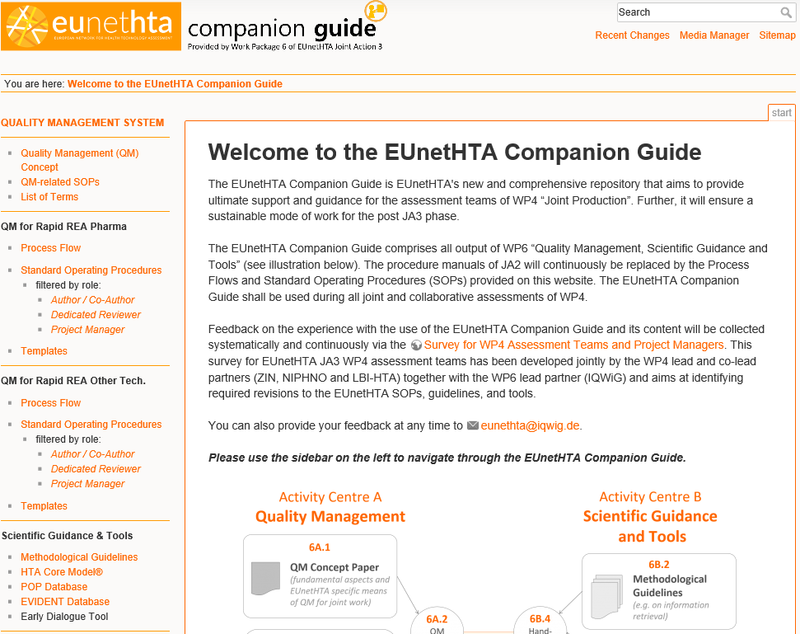 The Companion Guide is accessible to EUnetHTA Partners and requires a specific login and password. Consult the EUnetHTA Companion Guide here.